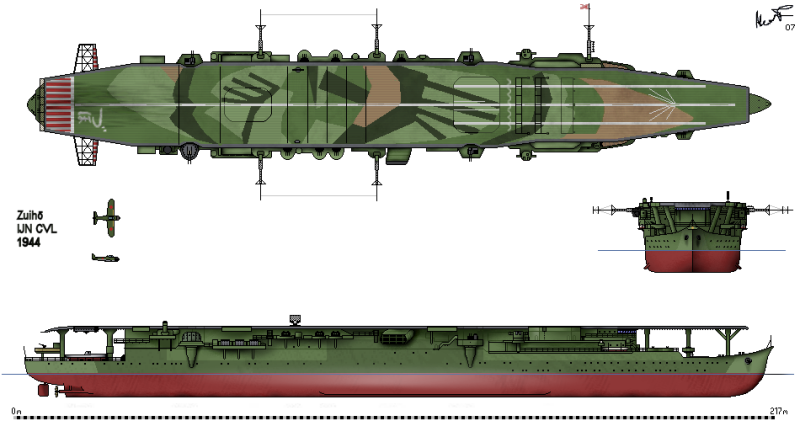 This page is dedicated to gathering all the possible information about the IJN Light Carrier Zuiho. In mid 2016 I decided to begin building a 1:100 scale model of the Zuiho from scratch. To see the build, click here. 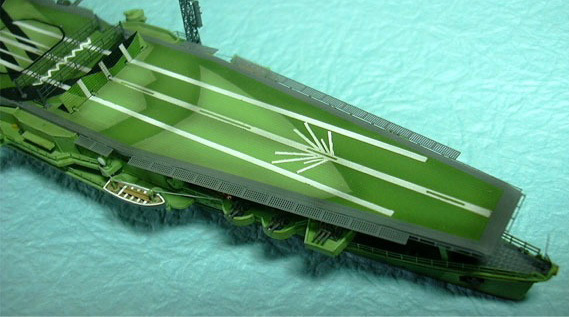 To see the commissioned ship, click here. 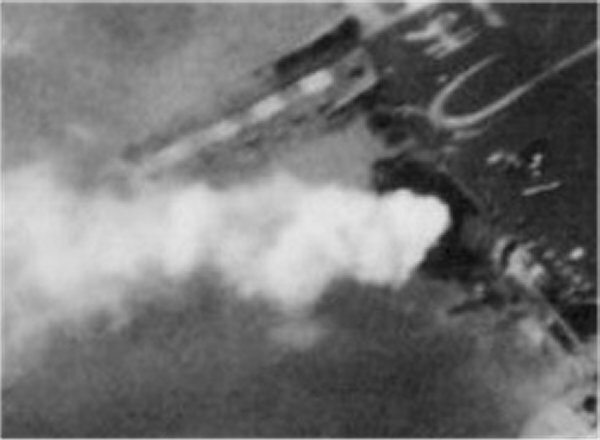 This image is of a damaged Zuiho maneuvering from air attack on her last day afloat. 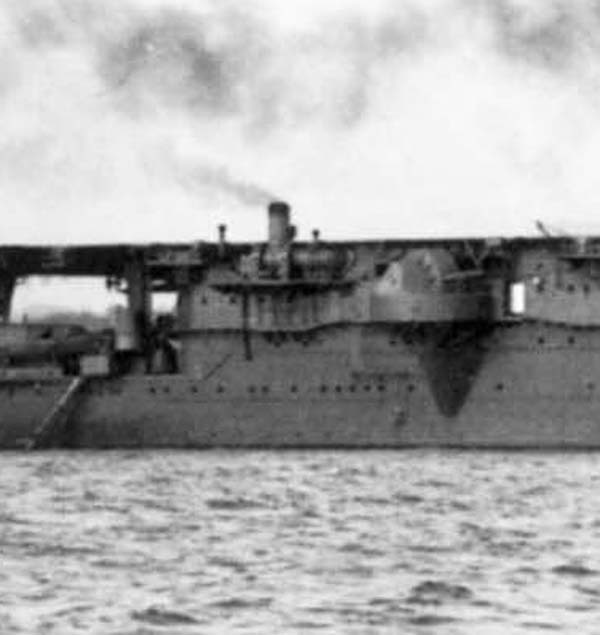 The Zuiho was the namesake ship of the Zuiho class of light carriers (a group of two aircraft carriers with sister ship Shoho) built for the Imperial Japanese Navy before World War II. Both ships were originally designed as fast oilers, but were subsequently converted into carriers. Zuiho was never commissioned as an oiler as she was taken over to be finished as a carrier before the ship was completed as an oiler. Commissioned on December 27, 1940, Zuiho played a secondary role in the Battle of Midway in mid-1942 and did not engage any American aircraft or ships during the battle. The Zuiho was not part of the principle carrier task force of Kaga, Hiryu, Soryu and Akagi (carrier Divisions 1 and 2), but she was attached to the actual invasion force. Since the invasion was cancelled due to the carrier task force’s decimation by the Americans, the Zuiho retired without seeing any action. The ship participated in the Guadalcanal Campaign during the rest of 1942. She was lightly damaged (2 bomb strikes) on October 26, 1942, during the Battle of Santa Cruz; it was her baptism of fire. She covered the evacuation of Japanese forces (Operation KE) from Guadalcanal in early 1943, after repairs. Her aircraft were disembarked several times in mid to late 1943 and used from land bases in a number of battles in the South West Pacific. In between engagements, the ship served as a ferry carrier and a training ship. She took part in the Battle of the Marianas (The Marianas Turkey Shoot) and her air wing was seriously depleted. She had a full complement of 30 aircraft, but saw a full half of those aircraft being the “antiquated” A6M2 “Zero” acting in the role of fighter bombers. Zuiho operated north of Leyte Gulf in October 1944 in an attempt to thwart the American’s retaking of the Philippines. 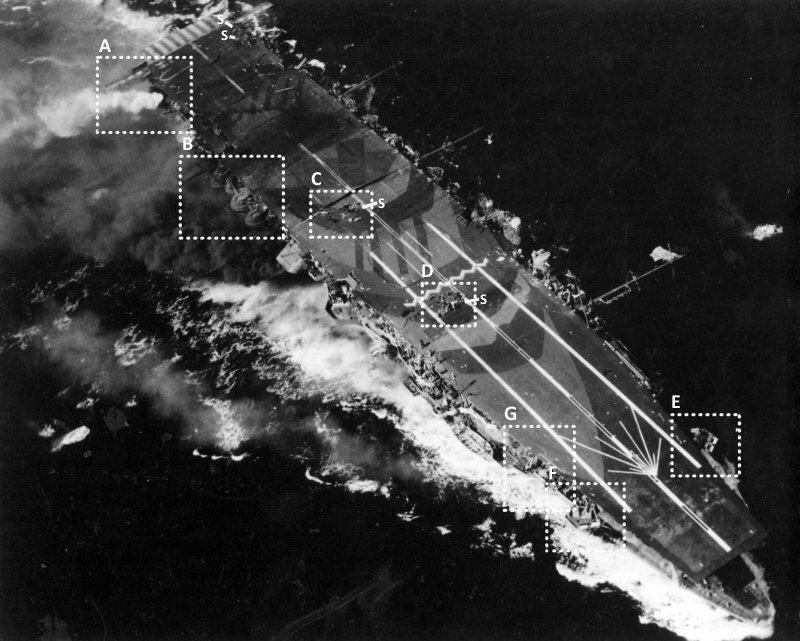 In this last battle (Battle of Cape Engano) Zuiho served as a decoy for the main striking forces to lure the American carriers away from the landings. She did not have a full complement of 30 aircraft, with her having 12 fighter aircraft (A6M5 “Zero”) and 5 torpedo bombers (B6N2 “Jill”) To the reader this is telling as to the shortage of front-line aircraft production and trained crews to man them. She was finally sunk by American aircraft while fulfilling her task as a decoy on October 25, 1944. She was sunk 2 years minus a day after her baptism of fire. The most famous picture of the Zuiho was during the battle of Cape Engano during the larger Battle of the Philippines. This section deals with information gathered about the aircraft types and quantities, plus the identifying markings and numbering of each aircraft type at each stage of the Zuiho’s career. 12 x Nakajima B5N2 “Kate” torpedo bombers. 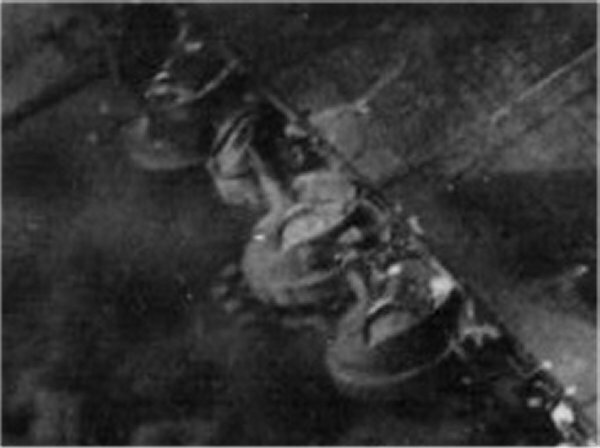 3 x B6N1 “Jill” torpedo bombers. 5 x B6N1 “Jill” torpedo bombers. 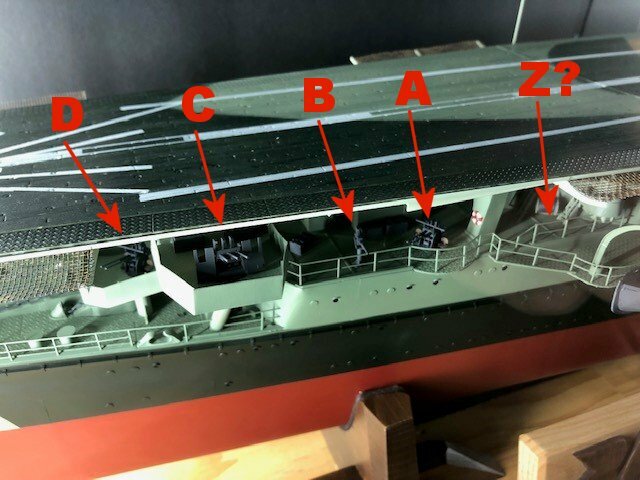 Clarification: The reason why this dissertation is important: I was building the 1/100 scratch build of the Zuiho and wanted the bow gun arrangements to be as accurate as possible. Something about the accepted layout bugged me, so an investigation and this dissertation of my findings was the result. 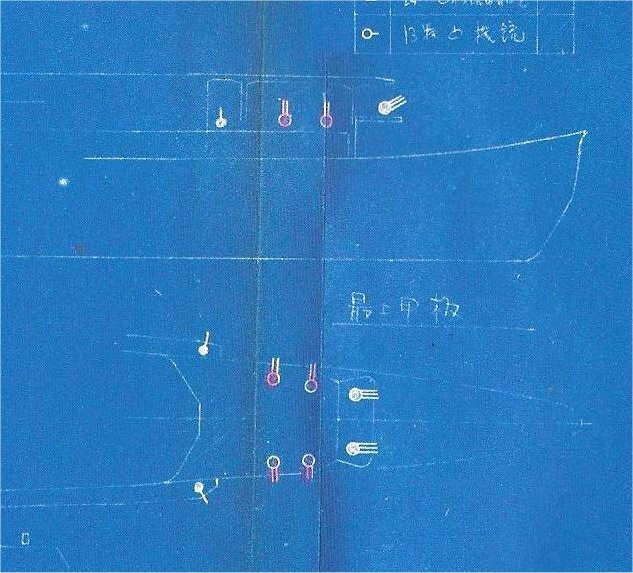 For those of you who know the IJN and their light carriers, one thing is painfully obvious: there is not a lot of conclusive data on their armament when it comes to their 25mm guns. Sure, we know where the majority of them were placed, but during late war refits and 25mm gun augmentation, there is little evidence. The single 25mm mounts are especially difficult as they could be bolted down anywhere there was a relatively clear field of fire. 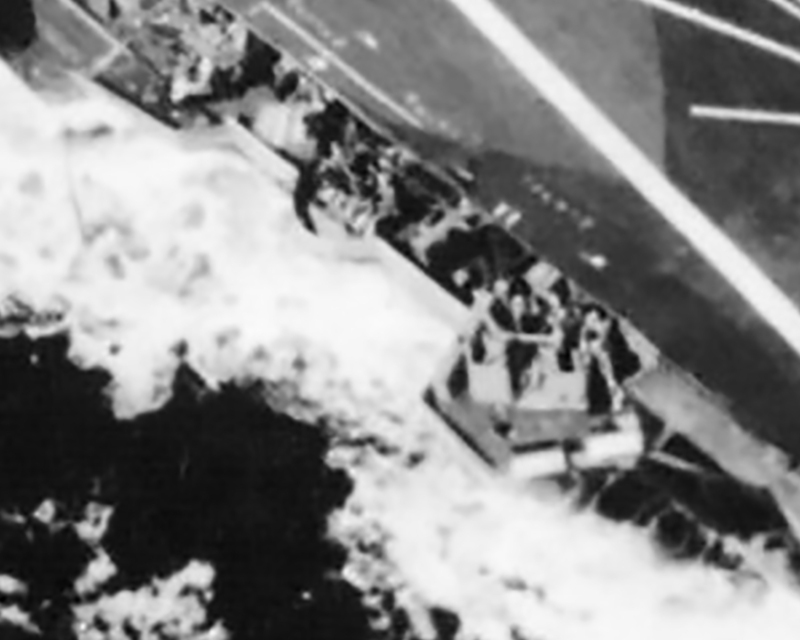 Additionally, the Japanese employed some single mounts on sleighs that could be carried around to different locations on the flight deck and screwed down, only to be moved to another location the next time it was deployed. Where and when this became the consensus is beyond me as photographic evidence of the ship on her last day contradicts this arrangement conclusively. No where else on this ship are gun mounts squeezed this close together. Added to the Zuiho’s confusing arrangements is that she underwent a major upgrade to her flight deck around the time that these 4 twin guns were added. The flight deck was extended 41′ (12.5M) forward. 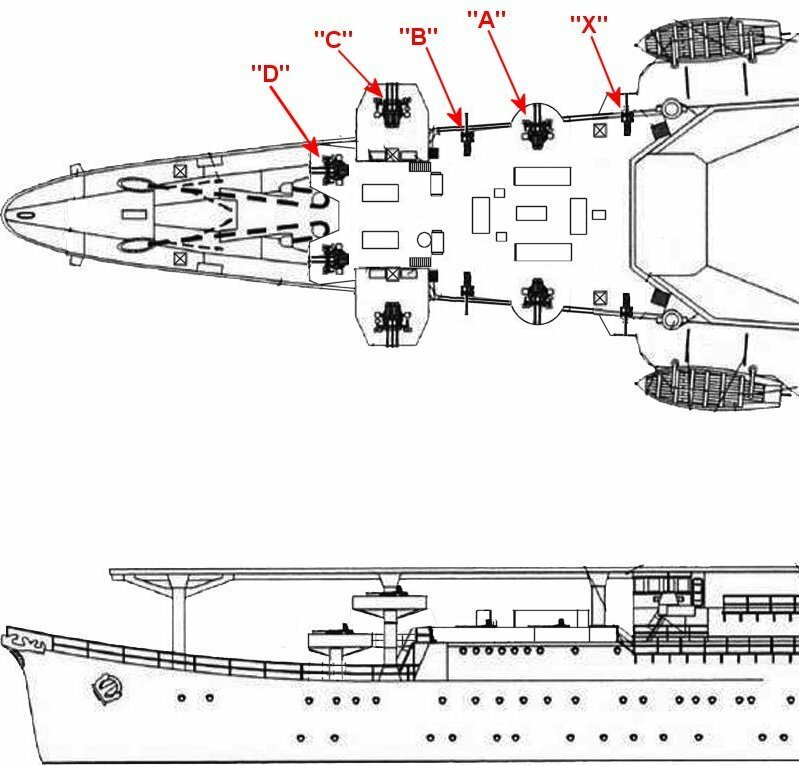 The consensus is that before the flight deck was extended, the Zuiho had 2 triple 25mm guns under the front of the flight deck. So, there was a platform for guns in that position already. Is the second mount possibly hidden by the bandstand mount (right-hand dashed circle)? Here is another image, albeit of poorer quality, taken on the same day. Here we can see only one semi circular twin mount platform on the main deck. The arrow is also pointing to another platform under the flight deck, fore of the bandstand triple 25mm guns. This was the platform that the bandstand triple 25mm guns were originally located on. Borrowed from Tamiya’s “Random Japanese Warship Details Vol 1”. 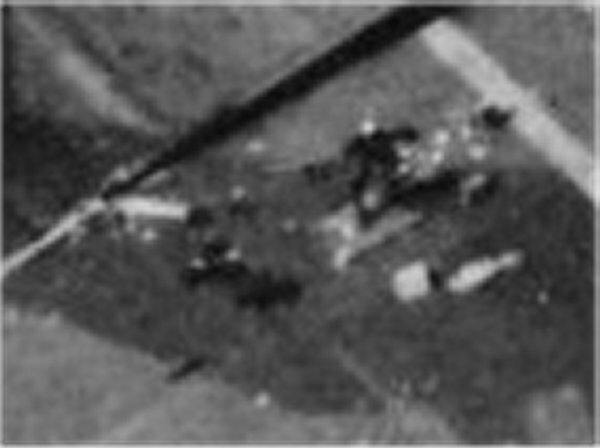 We can see the original flight deck and the added section in July/August 1944. 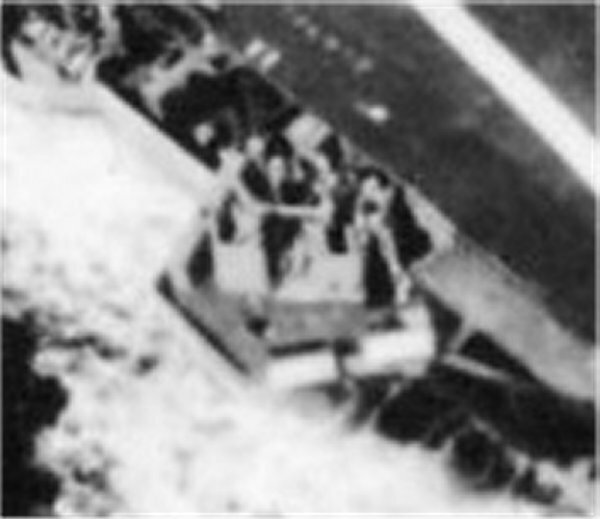 Here we can clearly see two sets of twin 25mm guns and the aforementioned triple 25mm guns under the front of the flight deck. 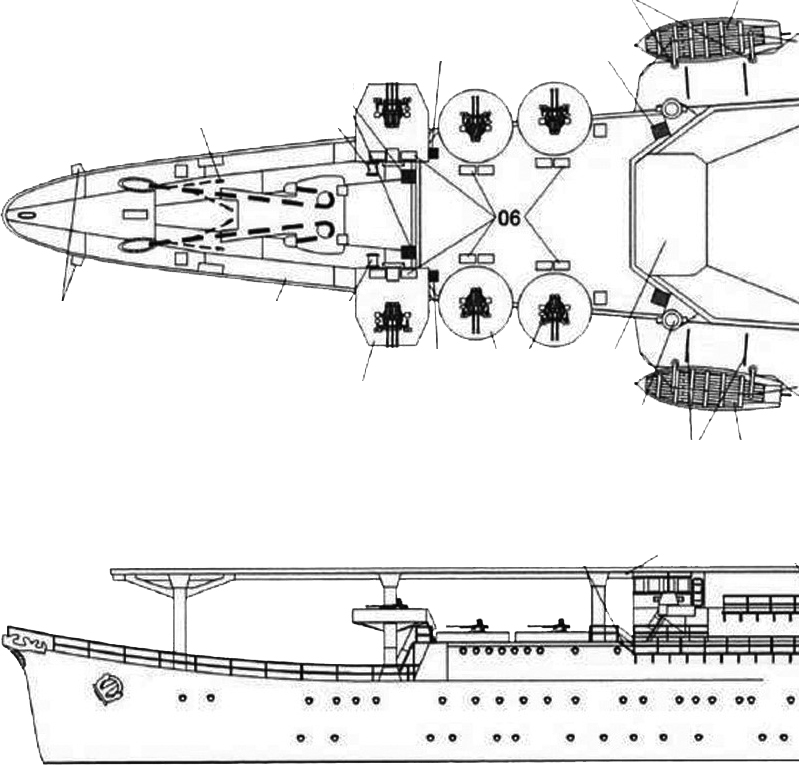 Look more closely at the above image: yes, it depicts the 4 double mounts in the position that is generally accepted as gospel, but this drawing is of the Zuiho BEFORE her flight deck was extended forward and BEFORE the two bandstand triple mounts were added. 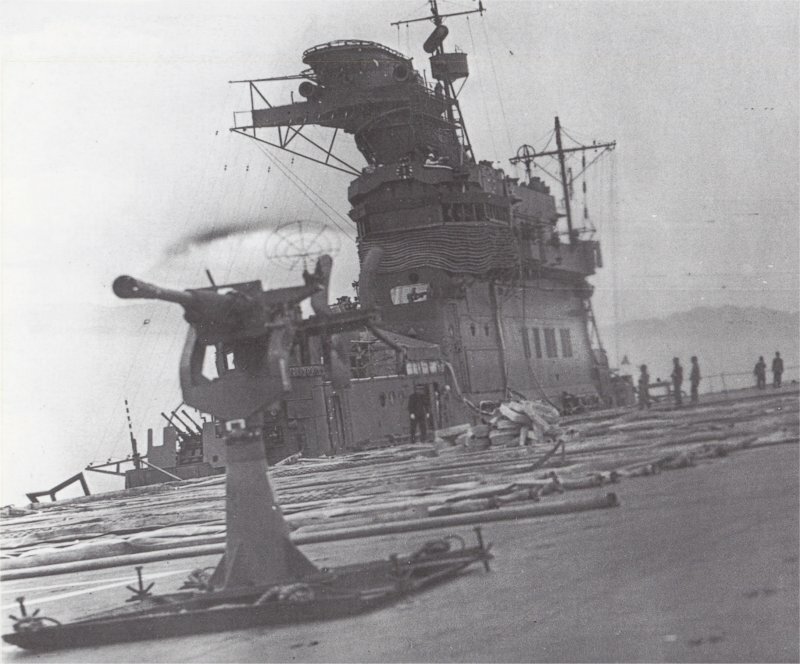 I submit that when the flight deck was extended forward in July or August of 1944, the gun positions were rearranged. Bear with me as there is a lot going on in this image. 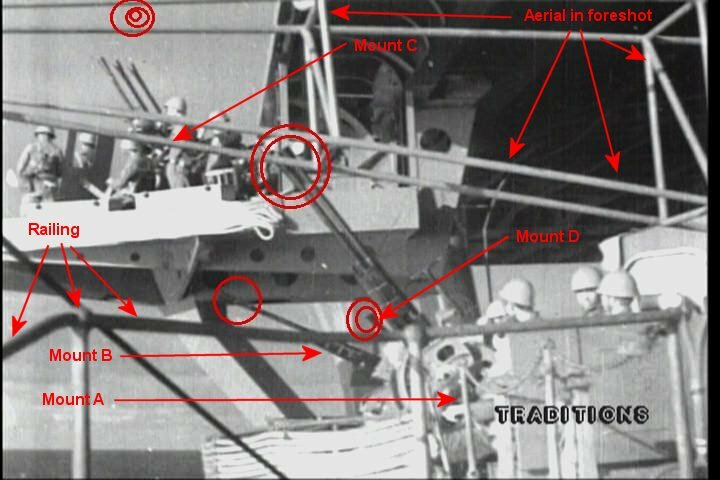 We can see 4 sets of barrels of 25mm guns, we can see the aerial in the foreshot and we can see the genral positioning of at lease two of the mounts: the fore framed twin 25mm gun and the bandstand triple 25mm gun. The number of red circles overlaid on each barrel indicate the number of barrels in each mount. 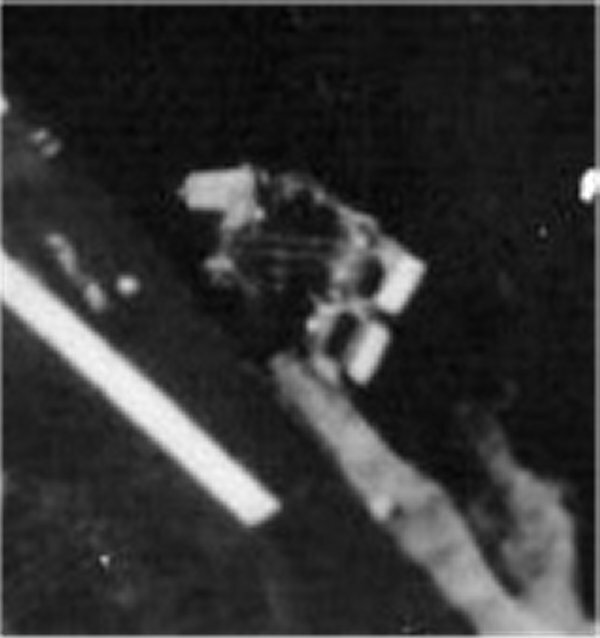 The teal dashed line shows the perspective of the camera in this image we are studying: indeed; Mount A obscures the view of Mount B and Mount D is all but hidden completely. We can ignore Mount X for the time being as it is outside of the cameras view completely. This modified image is the “smoking gun” for the theory I am advancing, in my opinion: Mount A is a twin 25mm gun. 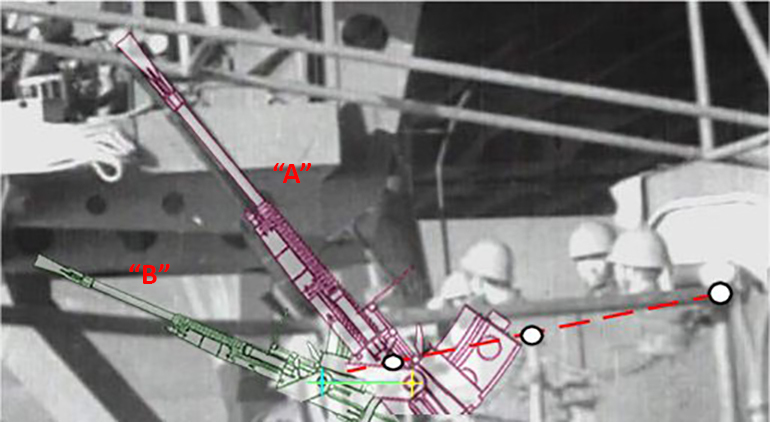 I overlaid the actual line drawing of the 25mm gun on the image. The pivot point of that gun is indicated by the yellow cross. Mount B is a 25mm gun as well, but the pivot point is slightly higher than the pivot point of Mount A. How can this be? 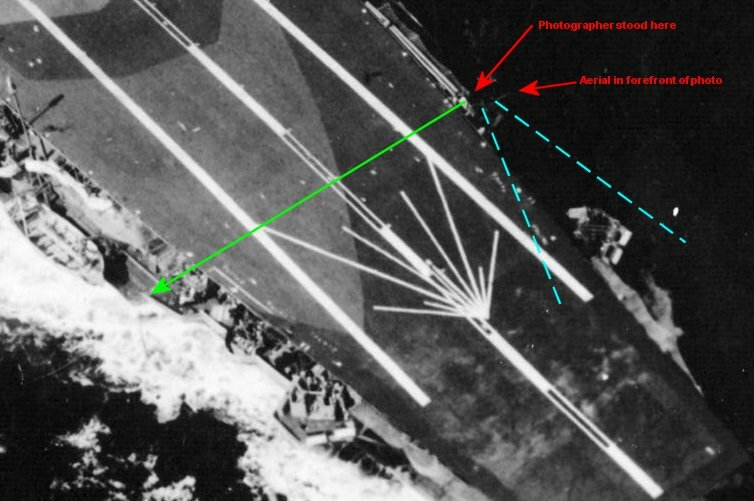 As we can see from the three white dots placed atop the railings and the diagonal red dashed line, the perspective of the image is descending from the forefront of the picture to the back (towards the bow). If both mounts were twin mounts, then Mount B’s pivot point would be noticeably lower than the pivot point of Mount A. There is a simple explanation for this: a twin mount is lower to the ground than a single mount: twin mounts were crewed from the seated position (pivot point height of 825mm) and single mounts were crewed from the standing position (pivot point height of 1180mm) . 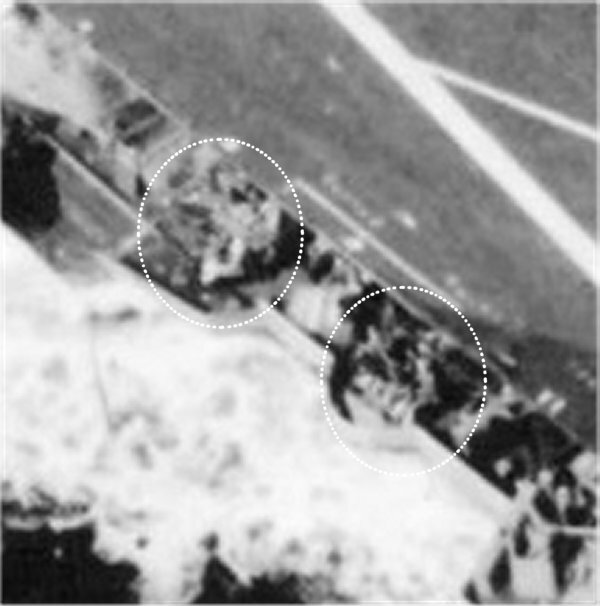 Additionally, a single mount would not require a semi circular gun tub either, a second of which is not present in the photos of the ship in October of 1944. Now let’s switch our focus to Mount D (under the flight deck). If the Zuiho had two triple mounts and four twin mounts, then it stands to reason that the triples from Mount D were moved to Mount C, and the twins from Mount B (if these were ever actually placed there) were moved to Mount D and the twins from Mount A stayed where they were. Mount B was a single mount from mid 1944 onward. 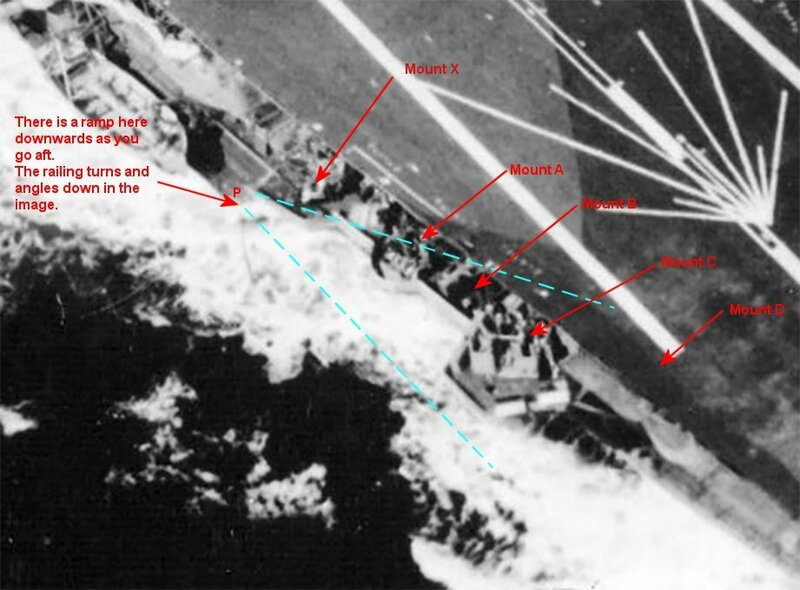 I had a hard time accepting that Mount D would have been retained due to the poor firing arcs that the flight deck and support posts would have offered Mount D’s position, but a wise man once said, “25mm guns are cheap and aircraft carriers are expensive”. Besides, in the second photograph above, the platform for Mount D was still there, so why not put guns on it as protection against low flying torpedo bombers? The platform for Mount A’s overhang is also not so pronounced and the photos support this layout more readily. Heck, maybe there was a single mount in location Z in actuality, but there was no space for it on my model, so I couldn’t add it. And so ends my dissertation on the bow mounted 25mm guns. Thank you for your time and I hope I have persuaded you to at least consider the alternative layout that I have personally accepted. This section shows the blown up sections of the scant few images of the actual ship. I have reference the source where possible. 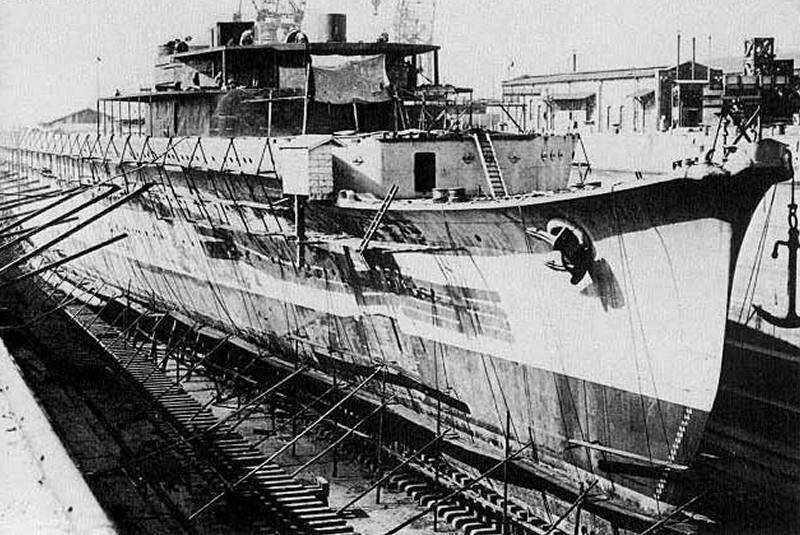 Construction of one of the two ships of the Zuiho class. Lots of details for the bow and forward of the bridge. This is the image that persuaded me not to used the alternating raised and recessed strakes when putting the plating on her hull. The sun is high enough that the raised strakes would cast at least thin horizontal shadows along the hull’s length and there are none. 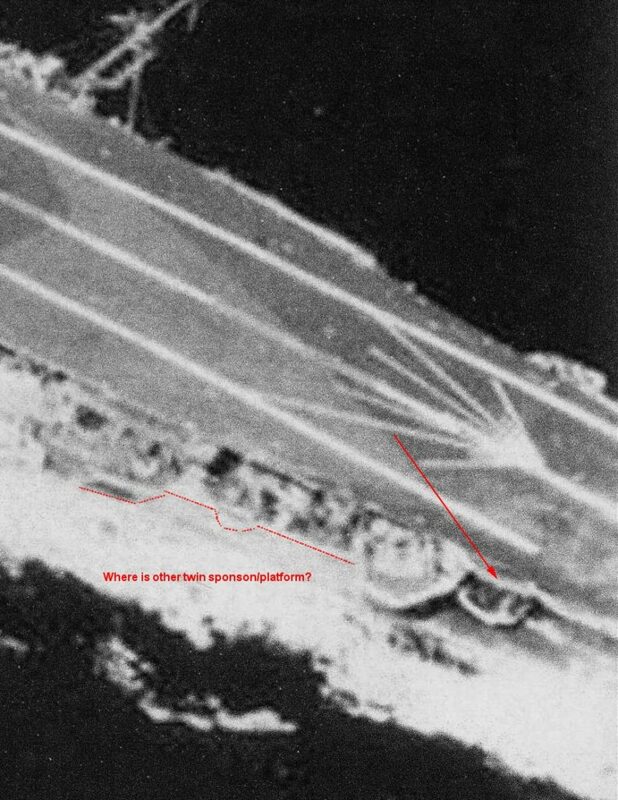 Due to the high quality of this image taken on the day of Zuiho’s sinking, I blew up some sections for clarity and reference. Thank goodness for modern technology like Adobe Photoshop! Detail A: We can see the white smoke pouring out of the donkey stack (auxiliary stack). 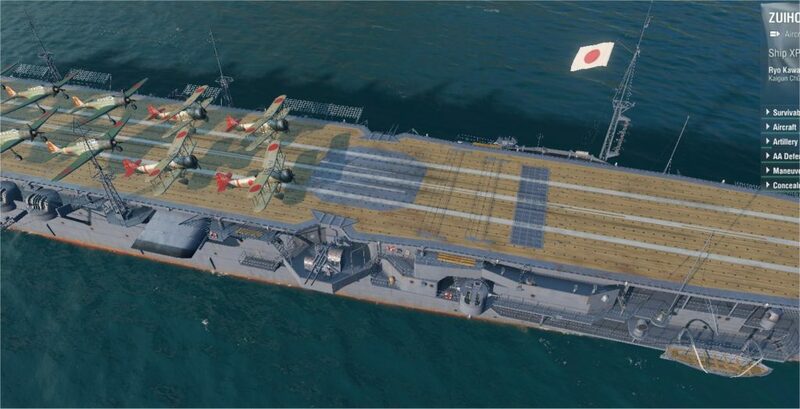 We can also make out the dark grey and white stripes on the navigation wing and the kanji for the Zuiho name. 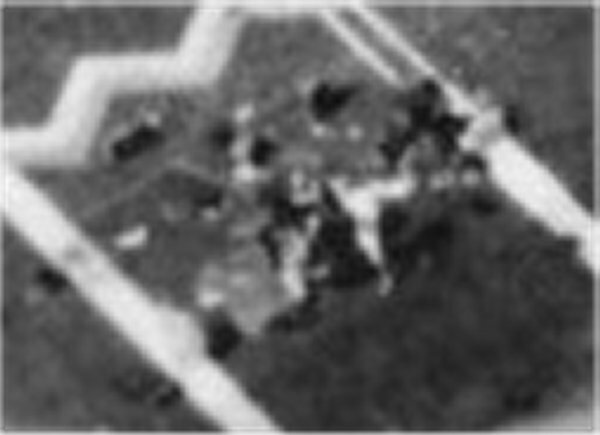 Detail D: More debris and this is most likely another 25mm sleigh position with ammo boxes below the zigzag paint near the top of the image=. The sleigh and gun itself is lost in the tangle of shapes in the middle of the image. Detail E: The port-side 25mm triple bandstand. This was added in July or August of 1944. It had a good field of fire as it is very clearly seen by the aircraft which is on the opposite beam of the ship. Detail G: The detail that got me started on my dissertation of the 25mm twins on this ship. The lower circle is Mount A and the upper circle is Mount Z. In Mount A we can actually see the gunner in the right-hand seat: his head, torso and legs. We can see no such detail on the upper circle. Detail G-a: I have traced the support post that resides withing the upper circle. If there was a gun in this position, it couldn’t be a powered twin or triple mount as the area is too tight to accommodate the size of these mounts and still allow for freedom of traverse. Indeed, the two dotted circles inadvertently outline the basic real estate required to operate one of the twin mounts. Not only does the mount itself take space, but so do the spotters and loaders that are running around the back and sides of these mounts as the mount is turning to and fro. This is a picture of the carrier Junyo taken after the war ended. The reason it is on this page is the 25mm sleigh in the forefront. 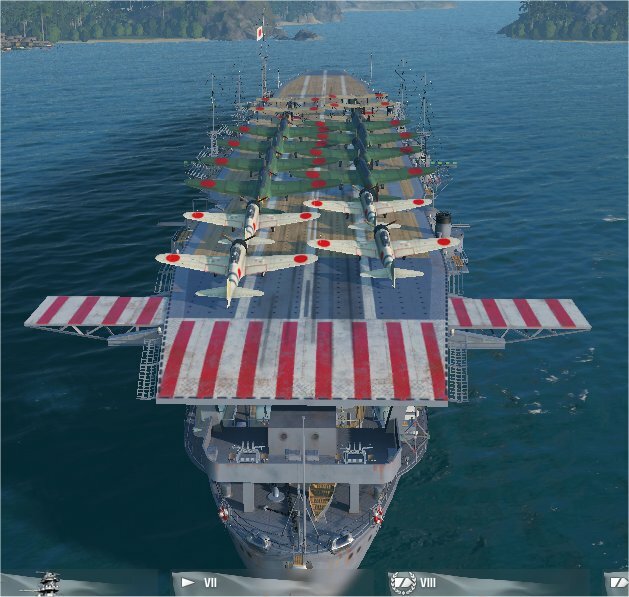 These were used on the Zuiho during her final sortie. There is no consensus on how many she carried. They were bolted down on the deck between aircraft operations and would need to be moved down into the hangars when aircraft were being launched or recovered. In the video game World of Warships, they have recently retired (Jan 2019) the Zuiho due to their Aircraft Carrier rework. Luckily I research the ship and all her components before this occurred. The final Hull to research did not depict the ship in her final guise as there are absolutely no twin 25mm guns on this hull. Here are some details of the Mighty Zuiho from World of Warships. Either way, she was pretty close to looking like she actually did and it was cool to be actually building the ship and then take her out for a battle virtually.